This is a guest post by Deb Viney who works at the School of Oriental and African Studies (SOAS), University of London, UK. It is about her experience of joining a new choir where harmony songs from around the world are learnt by ear. I really can’t remember how I heard about the SOAS World Music Choir but I know I loved the idea: a choir with no auditions, a promise we would never be asked to sing alone, learning music from all over the world, all by ear, in the original languages, anyone and everyone welcome, no experience necessary. I’d been missing music since I started my new job in London, so I thought I would give it a try. The first session was actually only a little scary. The room was full of newcomers, so none of us knew what to do. I think there were about thirty of us that first evening. We stood in a loose circle, clearly all wondering what would happen next. The choir director started with a physical warm up – kicking off our shoes, shaking out tight muscles and generally getting used to the idea of making strange noises by adding sound effects to a silly story. But then (amazingly fast!) we started to make much the same sound – even by the end of warm up, we sounded pretty good. I was really amazed how fast we could learn at least the basics of a song — this was my first experience with a choir and three or four part harmonies. The director would teach each part in turn, singing each part herself, then allowing us just a few repetitions, then on to the next part, then putting them all together, so quickly. In under 40 minutes we were raising the roof (or at least shaking the basement windows) with a song that sounded fantastic to me as a newbie! I think we learned two or three pieces that first session, but now, nearly three years on, I honestly couldn’t tell you what they were. However, I do remember I told someone the next day that it was the most fun I had had at work in ages! And did I mention the surprise at the end of the session? It turned out that the previous year the choir had acquired some ‘traditions’, one of which was an impromptu performance in the School’s main reception area at the end of each practice session. So we all trooped off with our coats and bags, and we just stood around the director and repeated the songs we had just rehearsed. There was no chance to be scared and it was a great way to get people used to performing. If you are interested you can find some of our rough recordings on YouTube. Those performances turned out to be a good recruiting tool, too! In 2007 and 2008 the choir was led by SOAS ethnomusicography graduate, Liz Powers, who brought astonishing energy and enthusiasm to each and every session as well as a vast range of music from Africa, Australasia and Eastern Europe and a few pieces in English. 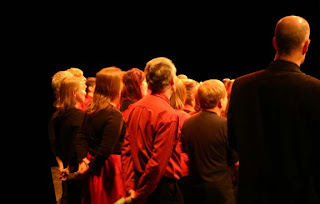 Choir membership varies between about 50 – 100 people each year. Sometimes only a small group turn up every week, the others are more transient, which can make it difficult to achieve a familiar repertoire. Also, as individual students move on, about two-thirds of the members are new each academic year. We only run in the Autumn and Spring terms as the Summer Term is swamped by exams. In summer 2008 Liz and her husband Andy (bass) had to leave us for Yorkshire where Liz now co-leads the Manchester Community Choir. We recruited a new director, Judith Silver, who is a singer-songwriter in her own right and a member of the Natural Voice Practitioners’ Network. Judith has a different style, but no less enthusiasm and knowledge! With her help the choir has survived its fourth year and we are now planning for Autumn 2009. The choir’s membership is incredibly diverse, like our School. We have had all sorts of members in those three years – Chinese, Korean and Japanese students, Muslim women in their head scarves, people of all ages — representing more than twenty nationalities from almost every continent of the world. This quite often means someone in the choir speaks the language in which we’re singing, so we work hard to get the pronunciation right! We even had enough men and ‘lower ladies’ for a modest-sized tenor and bass section. Many of us are not musicians or music students, but what we lack in expertise, we make up for in enthusiasm. Deb will be following up with another guest post in the near future.